With NEARLY 700 concerts in 40 countries and more than 2 million tickets sold THE SHOW has created renewed success for ABBA’s music - something that THE SHOW now celebrates by honouring the 45th anniversary of their first single release “People Need Love”. In Győr they will perform on March 25th, and the next evening, on March 26th in Budapest. The legend of ABBA begins in 1974 at the Eurovision Song Contest. Since then ABBA has become the biggest selling pop group in the history of the world, second only to The Beatles. The hit song Waterloo was their big break through and it was followed by a long list of no. 1 chart hits across the world. 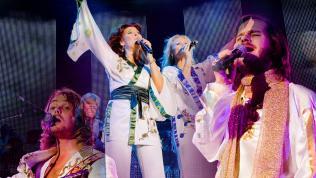 That ABBA hasn’t toured for decades is no secret so the torch is carried on by “THE SHOW – a tribute to ABBA” which has taken the position as the best ABBA tribute show in the world according to the Official International ABBA Fan Club. THE SHOW was created in 2001 and has since had an impressive 15 year run of world wide success. With NEARLY 700 concerts in 40 countries and more than 2 million tickets sold THE SHOW has created renewed success for ABBA’s music - something that THE SHOW now celebrates by honouring the 45th anniversary of their first single release “People Need Love”. ”One of the most important elements in creating the illusion of ABBA is to use Swedish singers in THE SHOW. They have a specific accent that cannot be faked. We don’t compromise when recreating the authentic ABBA sound.” Kenneth Svoldgaard continues. What separates THE SHOW from the pack is the success of recreating the two female singers that not only look like the originals but also sing so much like Agnetha and Anne Frid that even the most critical of fans applaud them. The two singers were cast after they won a big Swedish talent show performing as the ABBA girls and now they bring their talents to the world in THE SHOW. The music in THE SHOW is played by the Swedish band Waterloo and backed by The National Symphony Orchestra of London directed by musical director Matthew Freeman. They have performed with big stars like Elvis Costello, Robbie Williams and Sir Cliff Richard. ABBA is now a living legend which is proved by the sold out concerts for several decades, the Mamma Mia movies of great success, and last but not least the Mamma Mia musical which also had a huge success all over the world.